400 names, 400 journeys, 400 stories, 400 books: all are connected to form the foundation of a great city. That is the theme of The Great Wave or Saltwater Memories, a monumental art piece created from 400 hardcover volumes to celebrate the 400th anniversary of the city of Quebec. Conceived and constructed by artist Marc Lincourt, the piece has been washing ashore throughout Canada since 2008 and is on display at the Centre d'archives de Montréal from February 2- April 18, 2010. 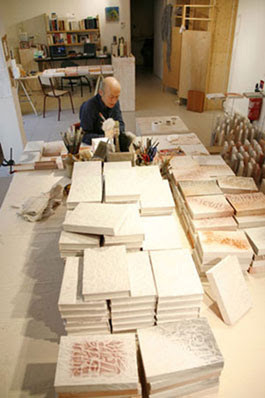 Artist Marc Lincourt And The Raw Materials Of The Great Wave. In size alone the piece lives up to its billing: this surging tide of books is two meters wide (6.56 Feet), 10 meters long (32.81 Feet), and reaches a height of 1.2 meters (3.94 feet). 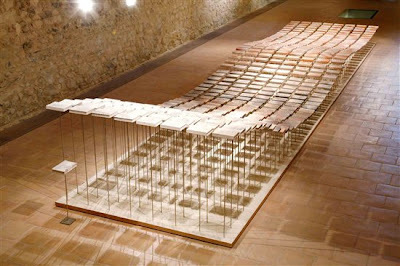 400 separate pieces, each consisting of a single hardbound volume sealed in a shell and impaled on a fiberglass rod, are the component parts. A wave shape is created by varying the length of the rods, and placing the books in a checkerboard pattern. A fan beneath the installation creates a breeze, and the wave gently undulates. 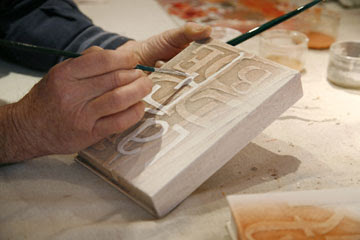 Artist Marc Lincourt Creating A "Book-Shell." Each of the 400 books represents a historic family involved in the founding of the city of Quebec. A roster of names was compiled from the manifests of ships setting sail in the 17th and 18th centuries from many regions of France to the New World. 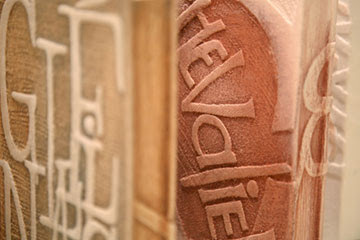 The family names are embossed in layered lettering on the book's covers, and the sealed volumes contain an imaginary secret history, a hidden narrative. The 400 distinct stories flowed together to form a single wave of settlers powerful enough to tame the wilds of New France. Each Shell Bears The Surname Of A Settler In New France. The placement of the books within the piece forms what artist Lincourt sees as a bird's eye view of the original settlements of New France. Colors of the volume's "shells" represent bodies of water, salt flats, and dashes of land along the coastal harbor. Even the materials used to make the shells are a tie to the importance of the bounty of the land: both fleur de sel and coarse sea salt form a part of each outer cover, a reference to the "white gold" that helped New France to prosper in its earliest days. The Wave From A Fish Eye View. The Great Wave or Saltwater Memories initially swept four venues in France, and Montreal is the swell exhibit's third stop in Canada. The decidedly French U.S. city of Lac Champlain will feel its billowing breakers in late 2010. One wonders what books were used for the book shells?